I finally watched Ghosts. To my surprise there were quite a few people coming to watch this film that for sure won’t give the viewer any pleasure. 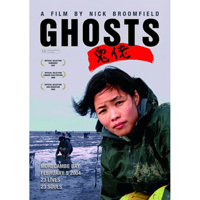 Although I’m fairly aware of the conditions Chinese illegal migrants live and exploitation they suffer from various news reports, this film still hit me hard, thanks to Broomfield’s matter of fact, non-judgemental way of telling the story, and Ai Qin Lin’s performance as the female lead, who herself was an illegal migrant from Fujian province. Ghosts is simply a replay of the tragic event. What Ghosts does, is to provide the backstory of the lives that perished that night. The plot loosely follows the journey of Ai Qin, from a village of Fujian to Norfolk, from paddy field to meat processing plants and apply farm, which ends up on the beach of Morecameby Bay. The scene that best illustrates the contrast between the dreams of those illegal migrants have and bleaking reality they face is when Ai Qin and other cockle-pickers arrive at Morecameby Bay, they are attracted to a beautiful rainbow that ‘welcomes us’. An interesting aspect of the film is its use of music. Chinese pop songs are constantly sung by the characters or played in the background. The songs become the only way they can remind themself the ‘bright future’ they are supposedly to have and their family connection back home. My only objection is the use Zhou Xuan’s Hua Yang de Nian Hua played when Ai Qin and other migrants cross the border of Eastern European countries in the fog of dawn. This is cerntainly not their song. I wish the film could tell us more about why Ai Qin and others continue to risk their life to come to work illegally in the UK. Ai Qin, like other others, is not naive enough to believe that money is easy to earn in the UK. They are vaguely aware of the risk and suffering they may face. But they still come. I wish the film could dig deep into the different personal circumstances, and perhaps the social pressure to earn cash quickly abroad and acceptance of the risk. Although the only person in the film involved in organising illegal immigration is not portrated simply as a villain, there is nothing more about why and how this is widely spreaded in some parts of China. Illegal migrants are at the bottom of UK’s economic chain, ruthlessly exploitated by the economic machine. At the end of the film, subtitles inform us although a few people have been convicted, the victims’ families are still in debt. And the news I have heard is that migrant cockle-pickers are back at Morecambe Bay. Only this time they are Polish. I wish The Morecambe Victim Fund is ”genuinely” to help those chinese victims ! how many family have helped so far ? One thing I’d really like to touch upon is that weightloss system fast may be accomplished by the perfect diet and exercise. Your size not merely affects appearance, but also the quality of life. Self-esteem, depressive disorders, health risks, and also physical capabilities are affected in an increase in weight. It is possible to do everything right but still gain. Should this happen, a problem may be the primary cause. While excessive food but not enough exercise are usually to blame, common health conditions and trusted prescriptions can greatly enhance size. I am grateful for your post in this article gywl512.